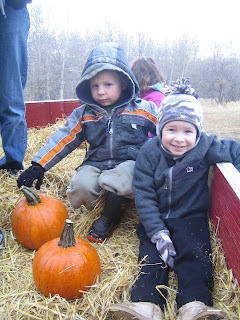 Saturday it was off to Butterfield Acres Farm to go one our first ever PUMPKIN HUNT! Grayson was so excited as I had been talking it up for about a week before we went! It was even more exciting because Sean and Amy were going to be there too. We had afternoon tickets which weren't out first choice as Sean and Grayson do need "rest" time in the afternoons, but as it turned out it was good thing. The temperature had dropped the night before and they actually had some snow on the ground due to the higher elevation of the farm. Thankfully by the time we got there at 1:00 pm it was a little warmer, but Shane needed a touque for his bald head and Grayson decided he wanted his cosy hat as well. 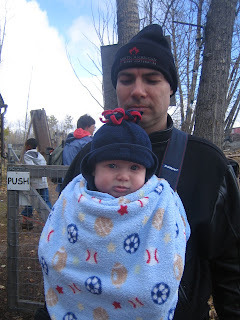 Shane took Sam in the Baby Bjorn and we bundled him up with a fleecy jacket, mittens and hat as well as blankets. So off we went. We boarded a farm wagon pulled by a tractor (a big hit with Grayson!) and headed out to the pumpkin patch. 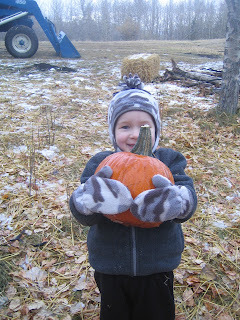 There was literally frost on the pumpkins, but Grayson found one that he liked.. It was almost bigger than he was! After we finished decorating we visited some of the animals - sheep, goats, donkeys, chickens and llamas - that live on the fram year round. Then it was off for a bite to eat. Sam did really well...he didn't complain being hauled around or being cold, and I fed him in the Jeep afterwards and he was happy as could be! It's funny though because you see pictures of folks who live in warmer climates going to pumpkin patches and it looks like our summertime! And although we had fun, I think it would be a little more enjoyable on a nice warm day! But all in all it was a good day and we would like to do it again. 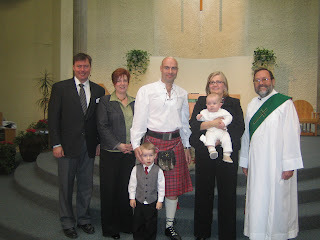 Sunday was a big day for Sammy - his Baptism into the Catholic Church! We had him baptized at St. Luke's church, and Deacon Louis LaPointe performed the baptism itself. 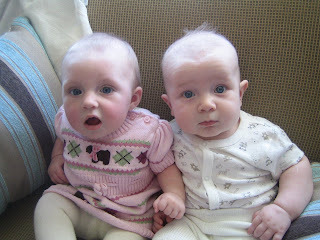 My good friend Wendy McDowell is Sam's Godmother and Shane's longtime friend Rob Anders is his Godfather. Sammy was so good during the ceremony, and actually slept through most of it. 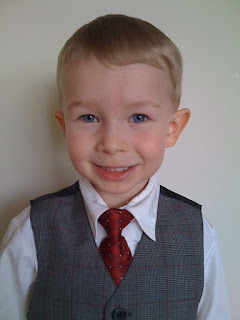 Grayson was on his best behaviour as well, and looked so handsome in his dress clothes. We are so proud of both our boys! 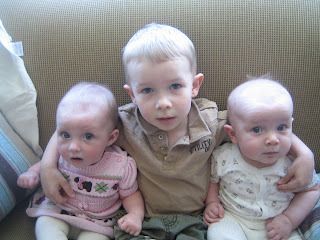 And here they are with the big guy Grayson. I'm sure as they all get older he will keep them in line! The only downside to the celebration was that mom wasn't with us. I really felt her absence this past month during my birthday and Thanksgiving celebrations. I think this Christmas will be pretty difficult as well. We will have to plan some kind of celebration at the nursing home, although I don't know if she will realize that it is a special day or not. Anyway...it was great weekend and we have some special memoreis from it! 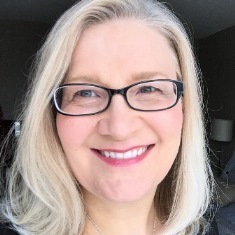 On the scrapping front, I have signed on for a great challenge at Just Cre8 - a great company headed up by Sue Sykes who contributes to Canadian Scrapbooker Magazine. It is a 5 week challenge and it is set up so you don't see anyone's work until each challenge deadline has passed. I will be excited to see what everyone comes up with for this weeks challenge of using a famous advertising slogan as inspiration for your layout. 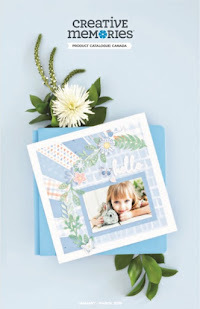 I am also taking the Giving Well 08 class over at BPS and am getting lots of ideas for holiday gifts and cards. I haven't made anything yet, but I am creating a great resource file of ideas to go back to. I think I am also going to take the Cut the Crazy out of Christmas class (also at BPS)in November from Georgana Hall. 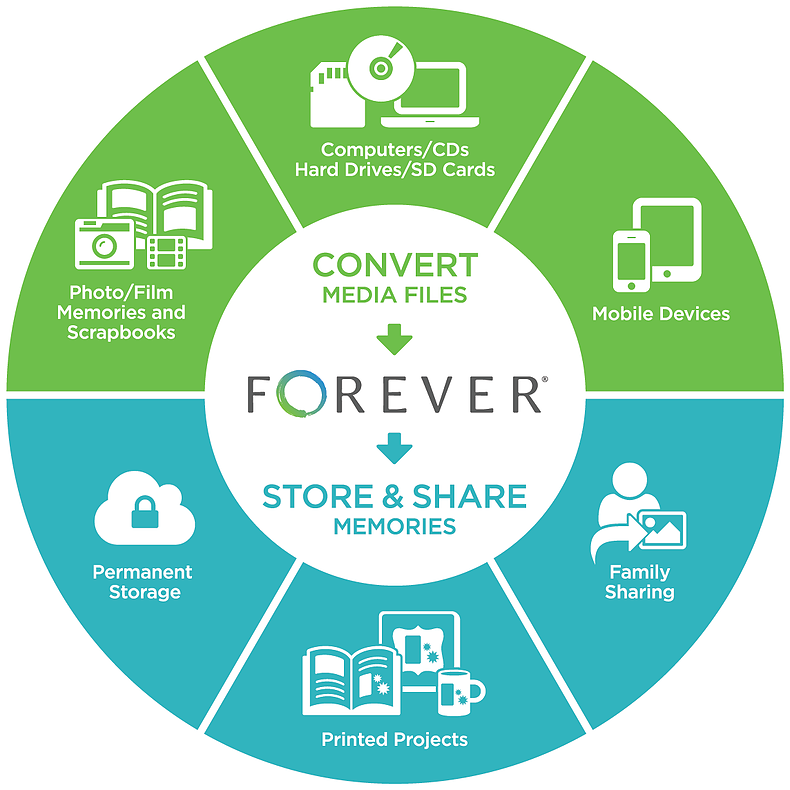 Looks like a great way to get inspired and organized in a creative way for the Holidays! Now I have no excuses to be rushing once the Christmas season rolls around!